Product #32106 | SKU CMX2000VA | 0.0 (no ratings yet) Thanks for your rating! 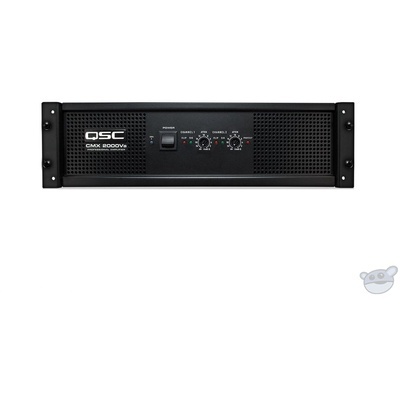 The QSC CMX2000Va 2500W Professional Power Amplifier is a 3RU power amplifier designed for live sound reinforcement applications such as for performance halls, houses of worship, sports clubs, gymnasiums, dance venues, pubs, and more. The amplifier uses a powerful, high-current toroidal transformer with filtering to ensure sufficient energy reserves. This allows the amplifier to handle high-level transients, even when driving 2O speaker loads. The amplifier output sections feature 3-tier class H architecture. The class H output section reduces AC current draw and cuts down on unnecessary heat. Automatic current limiting protects the amplifier from damage until the short is corrected. It also features DC protection systems to prevent loudspeaker damage in the unlikely event of an output transistor failure. DC voltage from the power supply is never passed directly to your speakers, even in case of an output circuit breakdown. A full complementary output circuit using high-grade linear output devices generates a flat-frequency response with low distortion. SMT (Surface Mount Technology) triples small-signal component density, enabling high power output in a 3RU chassis, less than 16" deep. The output devices are directly mounted to the heat sink to improve thermal coupling and cooling. The unit has the ability to directly drive 70 and/or 100V distributed loudspeakers. The amplifier may be used in either stereo or mono mode. For installations requiring a transformer isolated output, the CMX has optional accessories to accommodate different applications.